If heart-hurtingly adorable is your thing, checkout Asking for Trouble, which offers 'handmade cuteness inspired by Japanese kawaii'. Visit Asking for Trouble for cards (featuring 'Angel Bunny'), notebooks, book marks, zines, badges, and fabric bags, all decorated with smiling cupcakes, jammie dodgers, fruit, and animal friends. Asking for Trouble is also a record label, so you'll find a limited number of musical releases that come with little gifts! Illustrator Christine Berrie sells her tiny, detailed prints in her store - CB78. I recently bought one of her camera drawings and a print of her macaroon stack. All of the prints evoke a wonderful vintage feel. 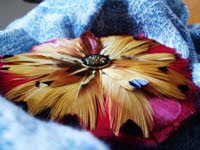 Femme de Plume offers amazing feathered earrings and exotic hair clips. Very Stevie Nicks meets Moulin Rouge. I am eagerly awaiting the addition of necklaces to her collection. 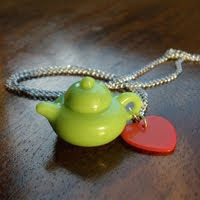 Visiting Mucky Puddle's Etsy shop is another foray into cute, but this shop's focus is quirky jewellery and accessories. 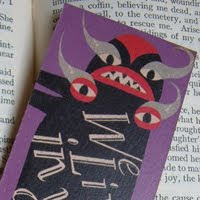 Enter the 'monster-ful world' of animator Lesley Barnes, and you'll find a collection of witty leather postcards that will make you want to get back to that book, even if it's dreadful. What could be better than a badge featuring a cross-stitched TIE fighter? I can't think of anything either, except maybe an R2-D2 cross stitch pin. These and more geeky treasures can be found in the Anonymity Blaize Etsy shop. 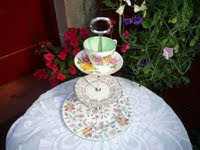 I wish I had known about Truly Madly Sweetly last June when I was looking for a cake stand for my anniversary party. The ones in this Etsy shop are made from mismatched china, and each is utterly unique. 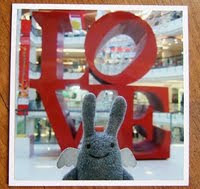 Marceline - so glad you're enjoying the blog! Your shop is great. Just visited www.toomuchfun.co.uk as well - great site! 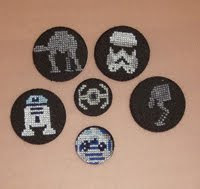 Have only just stumbled upon your blog - thanks so much for featuring my star wars badges. Glad you liked them. I think I may become a regular reader! And congrats on the awesome Etsy store.